Scandinavian design has a huge influence on interior trends around the globe. In 2018, elements from Scandinavian styling form part of our collection of Christmas crackers, tableware and decorations – helping catering operators create a warm and natural Christmas dining environment. A design movement characterized by simplicity, minimalism and functionality that emerged in the early 20th century, Scandinavian design flourished in the 1950s, in the five Nordic countries of Denmark, Finland, Iceland, Norway, and Sweden. Applied to Christmas décor, Nordic design provides a relaxed and calming festive look that embraces quality materials, with muted tones, clean lines and tactile, natural elements. To achieve a Nordic festive theme, News website Excella Global recommends using Kraft paper with images of Scandinavian wildlife, such as trees, snow and reindeers. In our Christmas collection 2018 brochure we offer two Kraft board Christmas crackers perfect for a Scandinavian themed dining environment or event. Made from renewable resources, Kraft paperboard is a hugely popular material, loved by customers for its natural, rustic appearance and a perfect match for other popular Kraft foodservice items, like cups, napkins and paper bags. The 11” Kraft reindeer cracker, cased in 100’s, is tied at the neck with natural raffia and comes filled with a delightfully home-spun wooden gift content – a very Nordic design element. The 12” Kraft Merry Christmas Tree cracker, cased in 50’s, comes with a sprinkle of glitter for an extra festive feel. 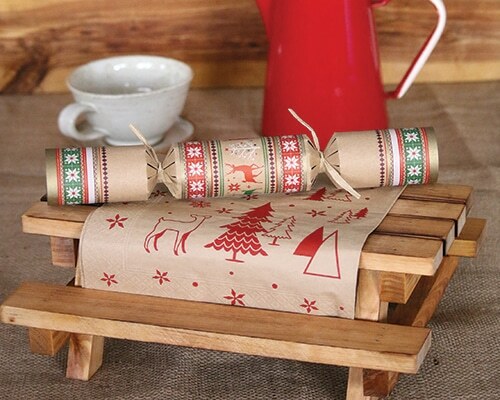 To build upon the Nordic theme, pair the Kraft Christmas crackers with a napkin from the Alps range from our supplier Duni. The Alps napkins have illustrations of Scandinavian wildlife on them (trees and reindeer) and have a knitted effect that gives them a natural and rustic look. In addition to our Nordic themed Christmas ranges, the 2018 Christmas collection brochure offers a huge range of crackers, tableware, hot cups and party accessories, to suit a wide range of catering operations and dining environments. Click here – to view our full Christmas offer. Christmas might seem far off, but according to the news website Huffington Post, July is the perfect time to start preparing for the festive season.